Puy de Sancy (Occitan: Puèi de la Crotz, "Mount of the Cross") is a French mountain, the highest mountain in the Massif Central and the highest of volcanic origin in Metropolitan France. It is part of an old stratovolcano which has been inactive for about 250,000 years. Puy de Sancy is in the Puy-de-Dôme departement in the Auvergne-Rhône-Alpes region. With an elevation of 1,885 m (6,184 ft) above sea level, it is the highest point of the department. The mountain was called during the 19th century as Puy de la Croix ("Mount of the Cross") because there was a big cross on the summit (the top of the mountain). That name is kept in the Occitan language. Puy de Sancy is in the Monts Dore, a chain of volcanic mountains in the centre of the Massif Central and at about 35 km (22 mi) to the southwest of Clermont-Ferrand; it is within the borders of the Parc naturel régional des volcans d'Auvergne ("Regional Nature Park of the Auvergne Volcanoes"). Several small rivers (streams) have their sources on the sides of Puy de Sancy. In the valley to the north of the mountain are the sources of two streams called Dore and Dogne; at an altitude of 1,370 m (4,495 ft), both streams are joined to form the Dordogne river. There are three ski stations (places where people go to practice skiing) on the slopes of Puy de Sancy: Super-Besse and Mont-Dore (together they are called the Grand Sancy) and Chastreix-Sancy. ↑ 1.0 1.1 1.2 "Puy de Sancy, France". Peakbagger.com. Retrieved 15 December 2014. ↑ "Le Mont-Dore". Massif du Sancy. Retrieved 15 December 2014. ↑ "Le Puy de Sancy" (in French). Office de Tourisme du Massif du Sancy. Retrieved 15 December 2014. 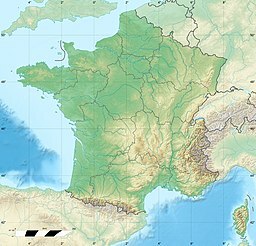 Wikimedia Commons has media related to Puy de Sancy. This page was last changed on 5 November 2017, at 17:25.